Went inside this bakery Saturday and saw Balthazar bread for sale. There were lots of empty bread racks, so I'll be curious if they will be selling their own bread. Specialty croissants (I cant remember if they were almond or chocolate) were $3.50 each. Muffins were $2.50. It was crowded. Off to a good start. Tried croissants and cheese danish, both fresh and delicious. No bread this morning, but looking forward to try some. Oh! Thanks for the clarification about the smashburger. I was wondering how they were going to serve burgers from another chain. two visits so far and we're converted. my partner had the pear tart yesterday and thought it was excellent. i picked up two kouign aminn this morning, and i'm loving mine - flaky where it should be and sticky where it should be. and tasty. on a par with Canelle, for sure. I love it and I'm hooked! I've been 3 times since their surprise soft opening last weekend. Was there this morning around 8am and it was very understaffed - I don't think that they've anticipated how much traffic it will get during the morning rush. The two workers behind the counter were friendly and helpful but definitely could have used another set of hands. There was a steady line of 5-6 customers. There's a new "we're open" sign and posted hours are 6:30am-10pm! I noticed that the bread racks were full and they also had bagels. As usual, the items we ordered were absolutely delicious. I don't know how I'm going to make it to work every day - or make it home, for that matter! - without stopping by! This place is dangerous!! Excellent patisseries. And actually, really well priced. Haven't been yet, but noticed it was attracting a lot of people--and people of all ethnicities. Which makes me think of the commenter who said it's not located in the right place, because, this commenter said, it's too near the Indian stores. In fact, it's located perfectly, right on the way to the transit hub at 74th and Roosevelt. I understand they will be offering more than just bakery items--full meals, eventually? sandwiches, not really full meals, i believe. the clientele and the staff are indeed representative of the neighborhood, in terms of ethnicity. i asked about breakfast items and savory pastries, which are coming. one of the young women behind the counter informed me that everything is, and will continue to be, halal, and no alcohol will be served. 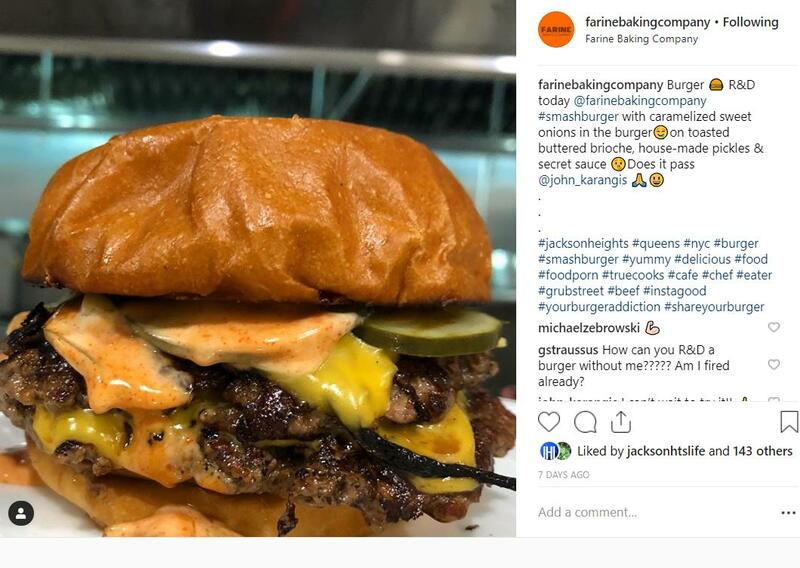 I just ate this from Farine. 3 bucks. I almost passed out from its deliciousness. Not too sweet. Rich, indulgent, subtle, spectacular. This is what happens when you get a world-class pâtissier in this neighborhood. I started with the classics--pain au chocolate (chocolate croissant) and pain aux raisin (raisin danish)--both were very good, equal to Canelle's. Not sure if these came from Balthasar, like the bread or were made there. Looking forward to trying more. Happened to stop by Canelle's today after brunch at Bistro Eloise. It was really packed and a long line, so I didn't order. Good to see all the options and places doing well. Unfortunately, I started a diet last month...hopefully next will be more healthy food options in the neighborhood. So far, we've had the almond croissant, apple tart, mini apple danish, chocolate chunk cookie, and peach-almond tart. The peach-almond tart was the favorite. And the mini apple danish was the perfect sweet bite. We also got to sample the Mignano candy bar, which was quite good, from Chef Michael himself. We'll be back. We're all gonna be FAT PIGS! Reporting back from my first visit. They already serve sandwiches on the weekend, and I had the avocado toast--topped with poached eggs and served with salad. Delicious. On the downside--they do have a TV mounted on the wall though it's not turned on at the moment. Brought home a pain au chocolate and a cheese danish to try later. The place is very busy--it's definitely a hit and the customers perfectly the reflect the makeup of the neighborhood. Oh also, the neighboring table had the burgers and they do look just like the pic posted here. I asked the waitress who took my empty plate back to please suggest to the owner/chef that they do a salmon burger as well. That burger does not fit into our heart-healthy diet plans!